We learn at a very young age to “remain calm” in an emergency, and it’s one of those things that’s often easier said than done. One of the best ways to breed panic in emergency situations is to leave people in the dark—not just literally, but in terms of the information they are (or aren’t) receiving. When we have at least some idea of what’s going on, it helps us to make wiser choices about what actions to take…and to stay calm while doing so. AtlasIED argues that when organizations use separate systems for paging, emergency notifications, and entertainment, chances are they won’t play well together. Globalcom.IP, the company’s Announcement Control System (ACS) aims to solve this by combining IT, emergency notification, and pro audio into one platform. The solution uses two protocols: Audio over Ethernet (AoE) for audio distribution, and WAN Enabled VoIP for voice communications. The system is controlled through GCK, AtlasIED’s web-based software that runs on computers and mobile devices, allowing users to issue alerts remotely. Kramer Electronic’s VP-773 presentation switcher/scaler features a Mass Notification Emergency Communication System (MNEC) that will issue campus-wide emergency alerts via automatic text overlay (either full screen, or in the form of a crawler), with optional audio alerts as well. The switcher will boot up displays that are turned off to distribute urgent messages to as many sources as possible, and the system is built in compliance with the official United States Emergency Alert System (EAS). 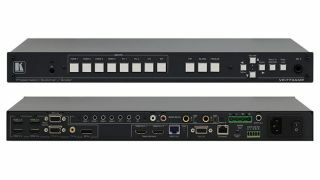 The VP-773A features eight inputs (one DisplayPort, one composite video, two computer graphics and four HDMI); after scaling the video and embedding the audio, it will output the signal to two identical HDMI outputs, and one HDBaseT TP output, along with S/PDIF and balanced stereo audio outputs. An audio amplifier and speaker outputs are also included. Designed to be comprehensive yet quick to deploy, the Alertus Emergency Notification System is compatible with a number of the mass notification systems that are out there. Alerts can be issued via voice, visible signaling, text, graphics, and tactile notifications, all of which can be controlled and managed through a web-based application. Among the system’s components are the wall-mounted Alertus Alert Beacon, which will flash and sound to get people’s attention, as well as display messaging about the emergency; and Digital Signage Override, which will take over LCD screens, LED displays, and other digital screens to display emergency alerts. Alertus’ system complies with a number of regulations, including the Americans with Disabilities Act (ADA), the Higher Education Opportunity Act (HEOA), the National Fire Alarm and Signaling Code (NFPA 72), and the Unified Facilities Criteria (UFC). The technology also supports the Common Alerting Protocol (CAP) developed by FEMA, and will operate with its Integrated Public Alert Warning System (IPAWS). Biamp’s argument against centralized processing and routing comes in the form of Vocia, a network paging and voice evacuation solution. Touting its flexibility, scalability, and reliability, the company says that because Vocia’s network architecture is decentralized, it eliminates the potential for a single point of failure (I.e. if one part of the system fails, the rest of it will continue running). The system incorporates standard IP technologies such as CobraNet and VoIP, and will integrate with an organization’s existing IP networks. For healthcare facilities, Vocia can be configured to include Nurse Call Integration (NCI) to automate, prioritize, and zone overhead paging.Vocia is EN 54-16 and RINA certified. Developers at Barix recently updated the company’s Simple Paging Solution, which enables users to issue emergency alerts from desktop computers or mobile devices. The new enhancements enable the system to integrate with emergency notification and background music systems, and a pre-gong chime has been added to master paging devices (such as the Barix Annuncicom PS1 or PS16) to grab people’s attention for important security announcements. The company says that its all-in-one solution is simple to roll out in both new and existing facilities, and that minimal IT knowledge is required to set up things like multiple paging groups. A typical solution comprises a Barix Annuncicom PS16, as well as Exstreamer IP decoders, and the Barix Simple Paging App. At Christie, Phoenix is an open content management systems that enables the transmission of emergency notifications to LCD flat panels and Christie MicroTiles. The system supports, text, graphics, and video, as well as prerecorded content, and the Christie Network Operations Center (NOC)—the company’s global digital signage monitoring and management system—enables the instant remote distribution of emergency information and instructions to multiple locations. Phoenix utilizes the standard IP network for transport and control of AV, and is modular so that users may scale it to suit their needs. iCOMPEL by Black Box is a sophisticated but easy-to-use digital signage solution for networked signage is packed full of features and benefits. Users enjoy features like touch interactivity, HTML5 support, transitions, transparency, localized customization, streaming video and a whole host of other advanced features. The GPIO interface allows users to connect their signage system to alarms and other external sensors. An information screen can be configured to change to emergency notification during crises—based on a signal sent when a secure door is opened or when an environmental condition occurs. The alert can be sent to all of the screens via the network for instant notification.